The Boston Celtics bounced back in a huge way Sunday night with an 111-108 win over the Cleveland Cavaliers. They were just embarrassed on their home court. They just lost their All-Star for the season. Yet, the Celtics pulled off a win on the road. While role players like Marcus Smart and Jonas Jerebko had a substantial impact, it was Avery Bradley's game-winning three with one-tenth of a second left that lifted Boston over the reigning champs for the first time this series. While it was LeBron James who was punishing the Celtics in Games 1 and 2, it was his sidekicks Kevin Love and Kyrie Irving who made Boston pay in Game 3. They combined for 57 total points on 18-31 shooting. This was nearly too much for Boston to overcome, but strong play from a number of Celtics helped them persevere. Celtics start with an all-defense lineup. Cavs start 5 for 7 from the field, including 4 for 5 from deep. Some tough shots, but still. For every open three Boston missed, the Cavs drilled a contested one. Kevin Love was absolute money, splashing home his first four three-point shots. Other than the shooting struggles, the Celtics really weren't playing bad basketball. They had solid ball movement on the offensive end, and Cleveland was just hitting tough shots on the other end. He finished with 10 of Boston's 24 points in the first frame. The Cavaliers carried their hot hand into the second quarter, while the Celtics offense became stagnant with Al Horford and Bradley on the bench. The 11-point hole stayed the same for about half of the quarter while both teams were giving their starters a breather. Love, Irving and J.R. are 13 for 16 from three. Both teams had slow starts to the second half. Although it looked like another blowout in the making, if there is one thing we have learned from this Celtics team it is that they live or die by the three ball. Once the three-pointers started falling for them halfway through the quarter, Boston looked like a brand new team. Playoff Marcus, baby! Bradley hit a three of his own to cut Cleveland's lead down to five. Boston played a great quarter defensively. They contained LeBron and Kyrie's takes to the hoop very well and limited the Cavs to 21 points, a series-low in a quarter. A Jonas Jerebko three to start the final frame put the Celtics just one possession away from tieing the contest. The Swedish Larry Bird was great in his time off the bench, providing energy, physicality, five rebounds, and 10 points on a perfect 4-4 from the floor. However, Tristan Thompson continued to put in work under the basket. 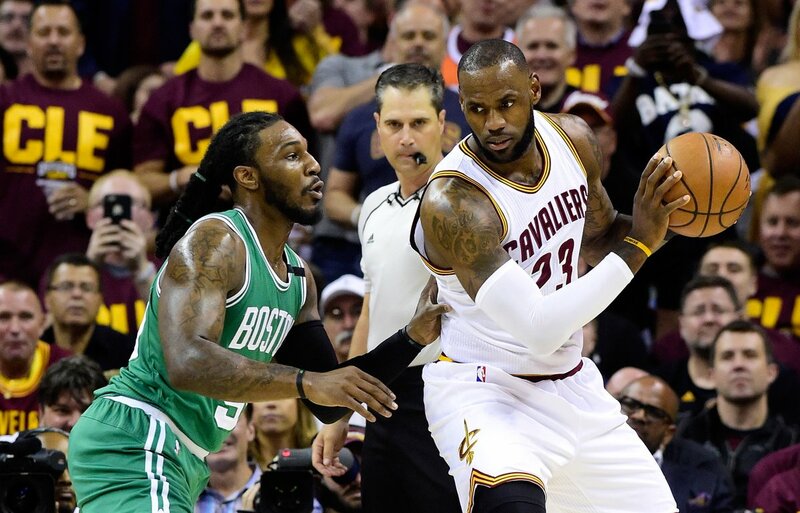 The Cavs big man was destroying Boston on the boards, creating six second-chances and finishing through contact. Thompson was 10-12 from the line, taking three more free-throws than the entire Celtics team at that point. The highlight of the night was Marcus Smart. Not only was the (usually) notoriously poor shooter absolute cash all night long (7-10 from three!! ), but he was making plays for his teammates too. How about this no-look over-the-shoulder pass to Bradley? At this point, the whole team was clicking. Olynyk returned to the game and was making plays, while Crowder and Bradley kept doing their thing. Olynyk's drive and lay-in over Love gave the C's the lead, 99-98. The contest was a back-and-forth nail-biter the rest of the way. Al Horford hit an inside jumper over JR Smith to put the Celtics up three with under a minute, but Smith responded by hitting a huge game-tying three at the top of the arc. They played with a ton of heart and determination. Hopefully, their rejuvenated competitive spirit will stick with them for the remaining of the postseason -- however long that may be. The C's cut the series deficit to 1-2 and will be guaranteed another trip home to Boston. Smart finished with a playoff career-high 27 points, along with seven assists and five rebounds. Bradley had 20, and four other Celtics had double-figures (Horford, Olynyk, Crowder, and Jerebko). Meanwhile, LeBron was very quiet all night and had one of the worst games of his season. They will be back at it Tuesday night, where they will look to stun the Cavs yet again and regain homecourt advantage.